Welcome to Thuze! Spend a few minutes going through this guide to learn some Thuze basics. We will introduce you to a number of useful Thuze functions that will help you as you begin interacting with your text materials. Learn more below by clicking the icon located next to the action. This video will introduce you to Thuze: over-viewing all of its features and describing how they work. Accessing Thuze is easy! To begin your Thuze experience, the Client Services team will assign you your eTextbook, at which time you will receive an email with directions on how to access it. Click here to learn more about the Thuze Web Experience. To get the Thuze iPad app, click here or go to the App Store on your iPad, search for "Thuze", and download the free application. You may log in to the iPad application with the same username and password used to access Thuze on the web. Click here to learn more about the Thuze iPad Experience. To get the Thuze Android app, click here or go to the Google Play Store on your Android Device, search for "Thuze", and download the free application. You may log in to the Android application with the same username and password used to access Thuze on the web. NOTE: You will need a tablet or phone running Android version 2.3 (Gingerbread) or higher. Click here to learn more about the Thuze Android Experience. 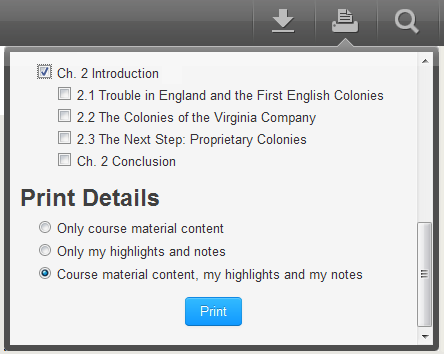 Please see the video above for a detailed walk-through of how to navigate your eTextbook's content. Thuze makes it easy to navigate your digital course materials and locate sections. Click on the forward arrow button, or the back arrow button on the sides of the reader pane. NOTE: If you are using the Thuze iPad or Android applications, to navigate to the previous section you can swipe backward with your finger. To navigate to the next section, swipe forward with your finger. You may also navigate via the table of contents in the chapter menu. To do so, click or tap on the contents button, on the tool-bar in the upper-left hand corner of Thuze. The chapters tab tells you the chapter and section you are currently viewing and lets you navigate to any chapter or section within the material. To access, left click or tap on the chapter or section title. Please see the video above for a detailed walk-through of how to search your eTextbook's content. Thuze features a search tool that allows you to search across your digital materials to find a particular word or phrase. Click or tap on the search button on the top right of the reader screen. Type your search terms into the text entry field, and submit them by clicking or tapping on the search button to the right of the field. You will receive a list of all areas within the book that contain the terms. You can click or tap on the listed terms to navigate to the area in which the terms appear in your text. Thuze will perform searches based on a variety of operators, including AND, OR, and NOT. To receive results for phrases with instances of both words, type AND as an operator – for instance: cognitive AND learning. To receive results for phrases with instances of either word, type OR as an operator – for instance: cognitive OR learning. To receive results of a word that is not associated with another word, type NOT as an operator – for instance: cognitive NOT learning. Use quotations to get an exact match with your search. Please note that Thuze cannot perform searches with special, non-alphanumeric characters. *This feature is only available on the Thuze Web Reader. Please see the video above for a detailed walk-through of how to create highlights and notes. 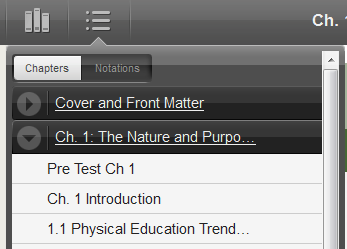 Thuze allows you to create notes and highlights within your eTextbook. Highlight text you feel is important and may want to refer back to later. Create notes to add your thoughts or cross-reference the content to something else. 1. Select some text by left clicking with your mouse (or tapping and holding on your iPad or Android device) and dragging it over the text you wish to select. Upon release, a toolbar will pop up. 2. Select the highlight button. The text should now be highlighted. Select an existing highlight by left clicking with your mouse or tapping. From the pop up menu, click or tap on a new color. NOTE: If you select a new color, it will stay for all new highlights until you change it. The new color will not affect highlights you have already made. Select an existing highlight by left clicking with your mouse or tap. From the pop up menu, click or tap the trash can button. Once you confirm deletion, your highlight will disappear. Select by left clicking with your mouse (or tapping and holding on your iPad or Android device) and dragging the cursor over the text where you want to create a note. Compose your note in the text box. Once you have composed your note, you can click outside of the text box to close it - the note will be saved automatically for you. To edit or change the color of a note, simply click or tap the note button in the text. The note will open and you can edit the content of the note right in the text field. You can also change the color of the note by clicking the different color buttons. NOTE: You can place up to 500 characters in the note box, including spaces. Select a note by left clicking or tapping on the in-text Note icon. In the bottom right hand corner of the Note box, select the trash can icon. Once you confirm deletion, you notes will disappear. Please see the video above for a detailed walkthrough of how to share your notes and view others' notes. You can subscribe to notes that other readers are sharing for your book, and share your knowledge with other readers. Click or tap the share icon when you are creating or editing a note (visible as the note icon with share indicators in the upper-right hand corner). NOTE: When the note is private, the share icon will appear gray. When the note is public, the share icon will appear green. If you have shared one or more notes, your name will appear to others in the Shared Notes list, so other readers can subscribe to you. Launch the Shared Notes pane from the footer bar of your reader (if using the iPad select the "Social" button in the upper right hand corner of the reader). Click the share button to the right of the person's name, and their notes will appear contextually in your reading material. You can unsubscribe by clicking on the same share button. This button will appear purple if you are subscribed to them, and gray if you are not. Within the text, others notes will be purple, with share indicators. These notes are read only and will contain the name of the person who created the note. 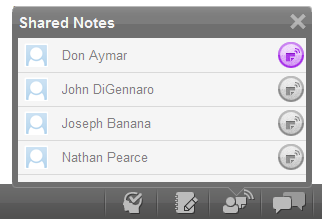 Your shared notes will have green share indicators. If you change your mind, you can un-share a note by clicking the share icon again in the shared notes pane in the footer bar of your reader. *This feature is no available on Android devices. Please see the video above for a detailed walkthrough of how to review highlights and notes. Thuze makes it easy to refer to the notations you've made in your text. You can view all of your highlights and notes by clicking or tapping on the notations tab in the contents drop down of the top navigation bar, from here you can quickly navigate to the location in the text where you created the highlight and note. The notebook is a place where you can review, manage, and edit all of the highlight and notes you create within the text. It serves as a study tool that helps you focus on the content that you need to remember. From the notebook you can edit, share, delete, filter, and change the color of your annotations. Click or tap the notebook button on the footer of the reader (found in the upper right-hand corner of the reader on Android devices) . Click or tap the note icon and the edit options will be available via a toolbar menu. The filtering function at the top of the notebook, allows you to view only the color and type of annotation you wish to review. All of your highlights and notes will appear by default, but if you only wanted to see your orange notes, for example, deselect your green and blue note buttons, and all of your highlight buttons. Re-select to bring them back into view. You can collapse sections that aren't important to review at this time by clicking or tapping on the arrow icon to the left of the Chapter or Section title. The back arrow to the right of the highlight or note lets you navigate to the place in the text where you created the annotation.